Raspberry Ketone Max is a daily nutritional supplement marketed to provide the recently popular raspberry ketone chemical. Raspberry ketone became a weight loss fad after it was popularized on a famous TV show. Since then, raspberry ketone has also been directly applied to the scalp to reduce hair loss and is used in foods, cosmetics, and other manufacturing as a fragrance or flavoring agent. 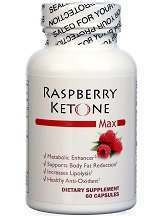 Raspberry Ketone Max bills itself as a metabolic enhancer that supports the reduction of body fat. Users are directed to take 1-2 capsules, 1-2 times daily before each meal. Children and women who are pregnant are instructed not to take the product. We were only able to find Raspberry Ketone Max for sale from the manufacturer website, which does not list the price unless the visitor first inputs personal information that we were not willing to provide. At the time of this review, we were not interested in being placed on any mailing lists. The only place we were able to find the price per bottle of the product was from a separate independent reviewer, who listed the price at $49.95 for a single bottle of 60 capsules. This works out to a price of $0.83 per capsule. According to the reviewer, there is also a prorated cost for 3 and 6 bottles, which works out to $0.56 and $0.42 per capsule, respectively. It’s entirely possible that this pricing structure is inaccurate or has changed; we merely report the information available at the time of our review. In a curiously candid statement likely required by the FDA, the product contains a warning that the recommended dose contains “about as much caffeine as 3 cups of coffee.” The label then goes on to warn users against caffeine intake from other sources while they are using this product. Raspberry Ketone Max comes with no manufacturer commitment or guarantee of any kind. According to the manufacturer’s website, Raspberry Ketone Max does contain 300mg of raspberry ketones, which is the ingredient that bears its name. This is one of the only things we can say about the product in a positive light. There were numerous red flags that we feel obligated to report as part of our review. The website was very gimmicky and felt more like being handed a flyer for a miracle weight loss product than purchasing a nutritional supplement. The product was not available anywhere else on the web and we found no reliable user reviews. The fact that the product contains 3 cups of coffee-worth of caffeine is perplexing; we don’t know why this is. The cost per capsule is between 2-4 times more than competitors. Finally, as if all this were not enough, to return to the actual stated purpose of the product, we even find the delivery of raspberry ketone insufficient. For consumers who are interested in trying a raspberry ketone supplement, we recommend seeking a product that offers 1000mg daily of a guaranteed natural raspberry ketone. For consumers interested in receiving some nutritional supplementation while cutting down on the cost of daily caffeine delivery, this product may be of interest.